Top 5 Wednesday is a great feature hosted by ThoughtsonTomes. To find out more about Top 5 Wednesday and the upcoming topics, check out its Goodreads page. It’s a new year and a new chance to tackle that TBR and this week’s Top 5 Wednesday is all about what books are at the top of our TBR pile and are the ones we want to read ASAP. I have an extensive physical TBR with almost 40 unread books with me in my flat, and then around 60 more unread books taking up residence in my mum’s flat. Oops! 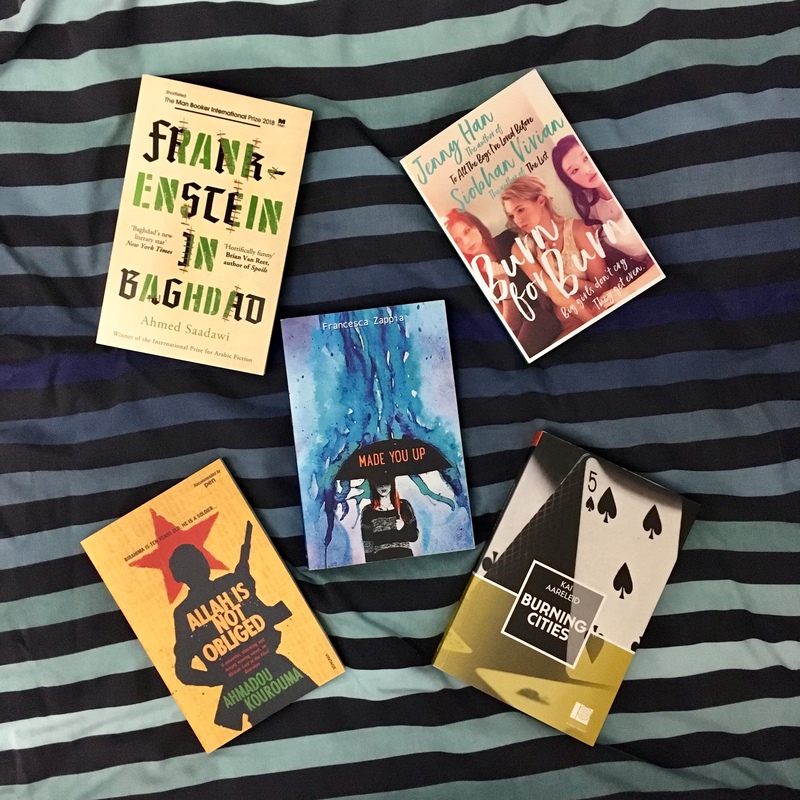 Here’s five books I do really want to read soon though! I got this for my birthday last year and I somehow have yet to pick it up. While I’ve not read the original Frankenstein, I know the story and am interested in seeing how this retelling works in US-occupied Baghdad. This is a book I hadn’t heard of before but got it one of those Buy One Get One Half Price deals in Waterstones. I’ve not read anything by Jenny Han (Though I’ve watched To All the Boys I’ve Loved Before and really enjoyed it) but I read The List by Siobhan Vivian a couple of years a go and liked it a lot, so I’m interested to see what I make of this collaboration. This was a Christmas present via the #TBTBSanta exchange and is probably one of the most recent additions on my TBR. I read and loved Eliza and Her Monsters, so I hope I like Made You Up just as much. I’ve owned Allah is Not Obliged for almost a year now after I bought it on last year’s London Bookshop Crawl, so I really should get to it soon. It’s a pretty short book, just over 200 pages, but it sounds like a hard-hitting one as it’s about a child soldier. Another birthday present from last year, I think the reason I’ve been putting off Burning Cities is because of its size. It’s just over 300 pages but the edition I have makes it look much longer. It is a multigenerational story which I do enjoy but I do have to be in the right mindset for it. What books are at the top of your TBR pile? I had Frankenstein in Baghdad on my pile for quite some time before I finally got around to reading it so feeling you there. I thought it was a pretty interesting and thoughtful tale. Ooh that’s good to know! I am very much a mood reader so TBR’s don’t tend to work out for me. I’ll probably read one or two of the books mentioned here over the next few weeks but then it’ll take me at least six months to read the rest of them!